The newest tropical depression in the northwestern Pacific Ocean formed Sunday, Sept. 11 far to the east of the big island of Japan. Tropical Depression 17W didn't have a long life, however, as the final warning on the system was issued 12 hours later. 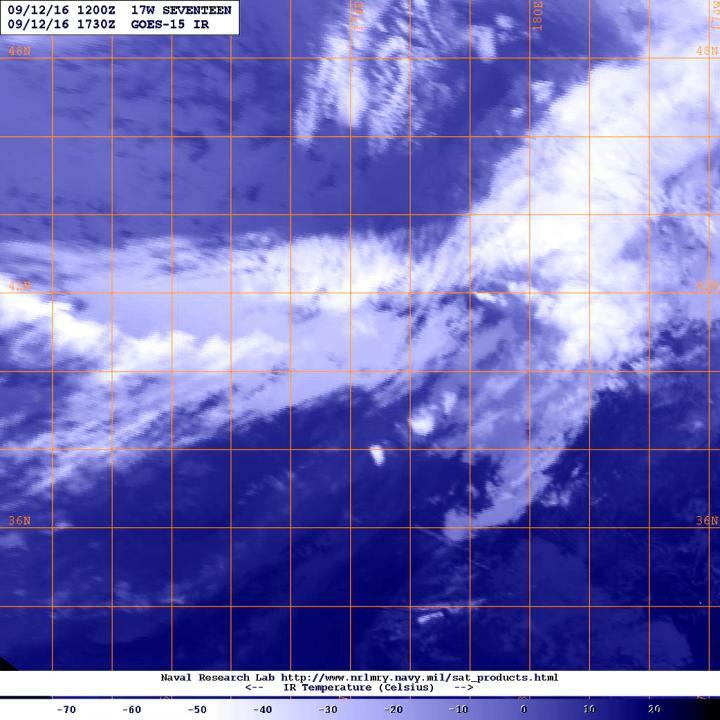 By Sept. 12 the storm lost its tropical characteristics. At 5 a.m. (0900 UTC) on Sunday, Sept. 11 Tropical Depression17W formed about 590 nautical miles east-southeast of Misawa, Japan. Infrared data from Japan's Himawari satellite showed that the depression appeared somewhat elongated. By 5 p.m. EDT (2100 UTC) the Joint Typhoon Warning Center (JTWC) issued their final bulletin on the depression. At that time, it was located near 28.7 degrees north latitude and 162.2 degrees east longitude, about 896 nautical miles north-northeast of the Japanese island of Minami Tori Shima. At that time, 17W was moving to the east-northeast at a speedy 24 knots. Animated enhanced infrared satellite imagery indicated rapidly decaying deep convection due to increasing westerly vertical wind shear associated with the mid-latitude westerly winds. On Monday, Sept. 12 at 1:30 p.m. EDT (1730 UTC) 17W became an extra-tropical system and NOAA's GOES-West satellite captured an infrared image of the storm. In the imagery 17W appeared more like a frontal system.